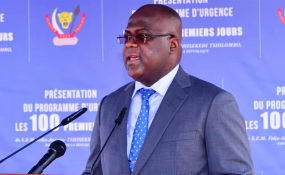 Following Kamerhe visit, Rwanda invited DR Congo President, Félix Tshisekedi, to this year's edition of the Africa CEO forum in Kigali, which is due in two weeks. Relations between Rwanda and the Democratic Republic of Congo continue to get better and better, the Minister of Foreign Affair Dr Richard Sezibera has said. Sezibera's comments follow the visit to Rwanda by DR Congo's Director of Cabinet, Vital Kamerhe, which focused on strengthening bilateral relations. "We see that our relations are good and continue getting better and better, be it in cooperation and curtailing those who wish to destabilise Rwanda's security that are [based] in Congo," Sezibera said Wednesday on the sidelines of the annual retreat for Rwandan Ambassadors. Kigali sees bilateral trade activities between the two countries going on well and their respective leaders want it to be sustained, Sezibera said. DR Congo President, Félix Tshisekedi is expected in Kigali soon. Sezibera, who was chaired the Ambassadors' retreat which ended yesterday did not divulge more about the Rwanda-DR Congo cooperation. However, it's understood that while in Rwanda on Tuesday, Kamerhe presented a statement from President Tshisekedi to President Paul Kagame, with the crust of the communication being to cooperate in stabilising the vast and often volatile eastern DR Congo region. For years, the region has witnessed violence caused by a number of armed groups including Rwandan militia who are remnants of the perpetrators of the 1994 Genocide against the Tutsi. The Democratic Forces for the Liberation of Rwanda (FDLR) have now teamed up with other new anti-Kigali rebels operating in eastern DR Congo. Earlier this year, Kinshasa handed over to Kigali two top FDLR officials - La Forge Fils Bazeye (spokesperson) and Lt. Col. Theophile Abega (head of intelligence), after they were arrested on the border with Uganda. The duo was last year arrested by Congolese security agencies while heading back to their hideouts in DR Congo, from Kampala, Uganda. Kigali maintains that the duo is now divulging significant information about anti-Rwanda rebel activity. Recently, according to a report by the UN Group of Experts on DR Congo, Kayumba Nyamwasa, a Rwandan fugitive residing in South Africa, is the leader of a new rebel group known as "P5", which operates in DR Congo's South Kivu province. If sustained, good relations and cooperation between the two countries are a sign of hope that efforts aimed at stabilising the vast neighbour's eastern region can bear fruit and lead to other joint trade and economic development gains. In early 2017, the two neighbours affirmed commitment to strengthen bilateral trade ties. Among others, Kigali and Kinshasa are collaborating on the implementation of a simplified clearance procedure under Common Market for Eastern and Southern Africa (COMESA), known as the Simplified Trade Regime (STR). Cooperation between Rwanda and the DR Congo can also go a long way in unblocking key development initiatives under the Economic Community of the Great Lakes Countries (CEPGL), a bloc bringing together Rwanda, Burundi, and DR Congo. The regional bloc in the past identified more than 20 development projects in security, energy, trade, ICT, environment, fisheries, and agriculture. Rwanda's resource-rich neighbour has a hydropower potential estimated at 100,000 MW and if properly harnessed can spur development in the region. Putting into good use the master plan for the vast arable Rusizi valley, a 175,000 hectares region - all underutilized farmland - shared by the three countries is another project that stands to benefit from good relations and security in the region.